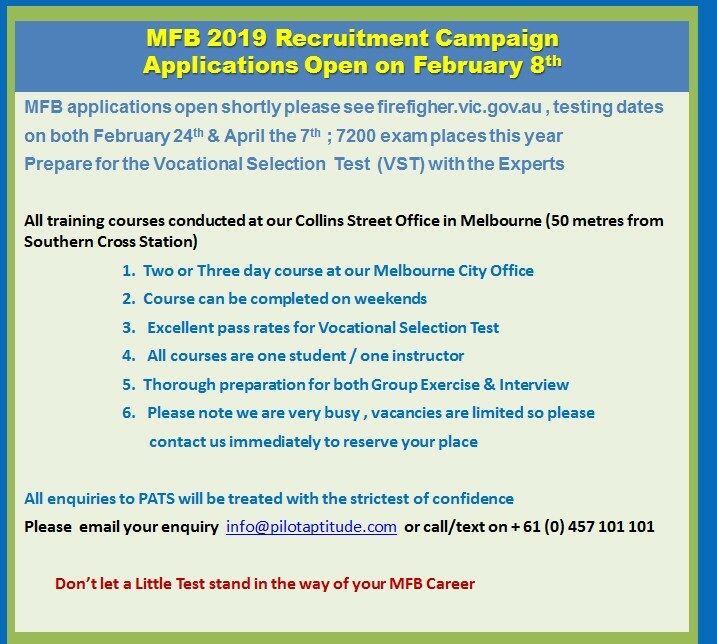 · The MFB ACER Vocational Selection Test (VST) is a very demanding aptitude test – there is no easy way to prepare. The simple reality is that nobody has the expertise that we have. Jetstar Pilot Cadetship, Cathay Pacific Cadetship, QantasLink, SIA, Rex Pilot Cadetship, COMPASS and Pilapt testing. YOU Session and Pilot Specific Test (or RAAF Pilot Selection Test) , or these days the Pilot Specific Test is now called Additional Testing Day. Ambulance Service of NSW selection test, Queensland Ambulance Service (QAS) aptitude/selection test, Ambulance Victoria selection/aptitude test, St John Ambulance WA entry test. SHL aptitude tests, Previsor selection tests, Onetest online tests, ACER ability tests, Testgrid psychometric tests, Talent Q aptitude tests. Aptitude tests can be prepared and studied for just like any other university, school, or professional level exam – in fact the performance and success of our clients demonstrates that it’s possible to significantly increase your test score. PATS have over ten years’ experience in selection test training. Our courses are industry leading – by a significant margin. And they’re designed to suit your specific needs. We can provide a prep course if you want to apply with one employer, or multiple employers and the course price remains the same. · Extensive take home practice materials. Most aptitude testing results are valid for a year which means multiple sittings aren't allowed - we know the selection techniques most commonly used and we prepare you for them. “The PATS course was a significant factor in me achieving strong passes and succeeding with my aspiration to be selected for ADF pilot training.” Midshipman Lisa Blakiston, Royal Australian Navy Pilot. Enter your credentials to receive newsletter. I accept to receive the newsletters.